No foolin’ — our spooling, stylin’ runner is almost finished! 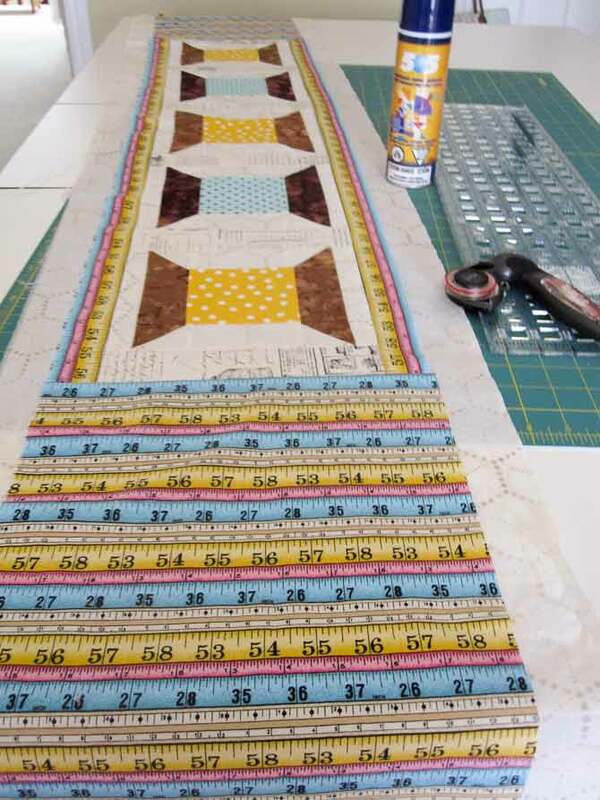 Today, we’re putting the finishing touches and quilting the Only Spooling Around table runner for the Studio Collection Home Hobby and Design Table from H.A. Kidd. I used two colors for the center “thread” on the spool block, so I alternated colors. Cut six (6) sashing strips, 2-inches wide by 8 1/2-inches long. Attach sashing vertically between each block of the table runner. Press with steam. Attach sashing strips between each spool block. 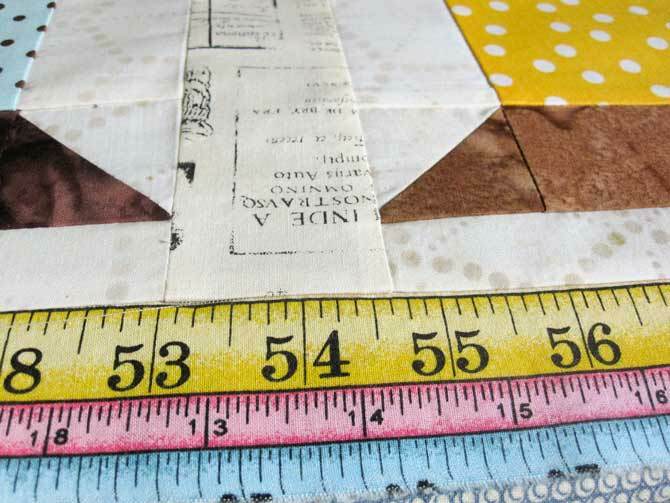 Along the width of fabric, cut two 1 1/2″ strips. (I found it easier to tear these two strips.) Attach the strips along the entire length of the runner. Press the seam toward the center. Cut two pieces of fabric, 10 1/2″ wide by 14″ long. Attach these to either end of the runner. Press the seam allowance open. It’s easier to tear the long border strip than to cut it. While the the Studio Collection Home Hobby and Design Table from H.A. Kidd offers a very long cutting and design surface, the same can’t be said for my stash of batting. I didn’t have a long enough piece of batting, so I attached the extra bit using the zigzag stitch as shown in Elaine Theriault’s earlier post on QUILTsocial. Once you have a long enough piece of batting, make a quilt sandwich. Echo quilt the spool on the table runner. Spray baste the layers together using 505 Reposition Fabric Adhesive. Attach your machine’s walking foot according to the manufacturer’s instructions. Position the walking foot edge to the edge of the spool, echo quilt along the spool. Then, stitch in the ditch along the vertical sashing. Set your machine up to free motion quilt the side panels. 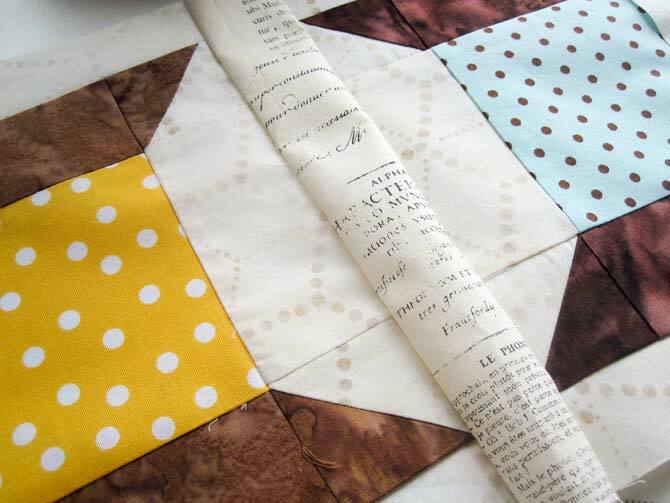 Baste the layers of the quilt sandwich together using 505 Adhesive. Cut four 2-inch binding strips along the width of fabric. 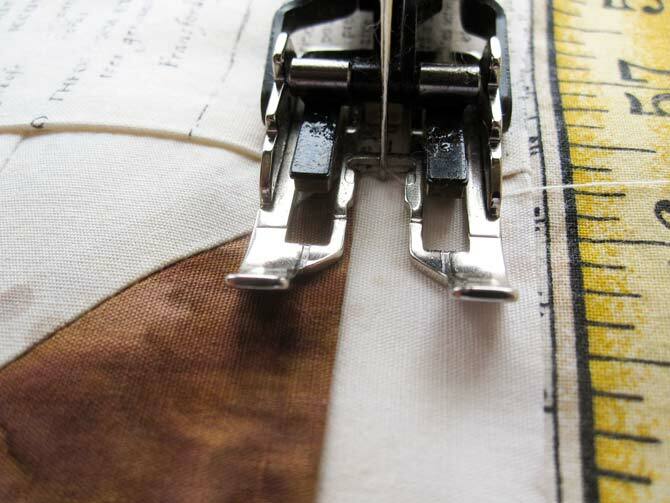 Join the binding strips together (see photo). Press the binding strip away from the runner. Turn the runner over and fold the binding strips to the back. Use Wonder Clips to hold the folded binding in place. Press the fold, taking care not to melt the clips with the iron. Slip stitch the binding to the back of the runner. 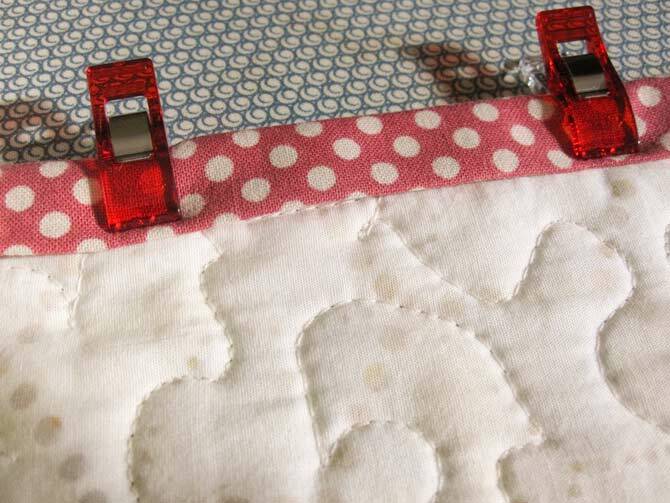 Use binding clips to attach the binding to the table runner. 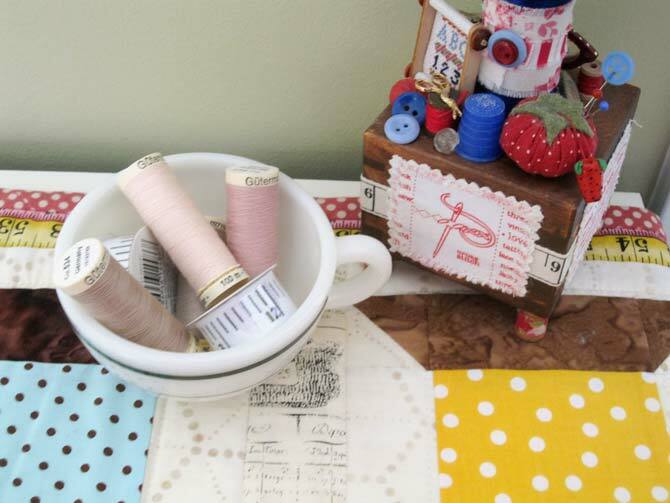 The finished table runner now decorates my Studio Collection space saving design/cutting table in my sewing space. When it’s folded up, it takes up less space than the bookshelf it replaced. And, it’s way more useful! Well, we’re done quilting the Only Spooling Around table runner. It can now decorate the Studio Collection Home Hobby and Design Table from HA Kidd. My table has a great new outfit for when it’s just being a decorative part of my sewing space. My time on QUILTsocial is over for now. Stay tuned for my post in the second week in March, we’ll look at how the Studio Collection Sewing and Design Table can save space, and provide a better creative experience, no matter how much room you have. Until then, make a mess, and have some handcrafted fun! Spools of thread are a quilters and sewers treasures! FMQ gets better and better every time we practice! Thank you for your comment Lori! 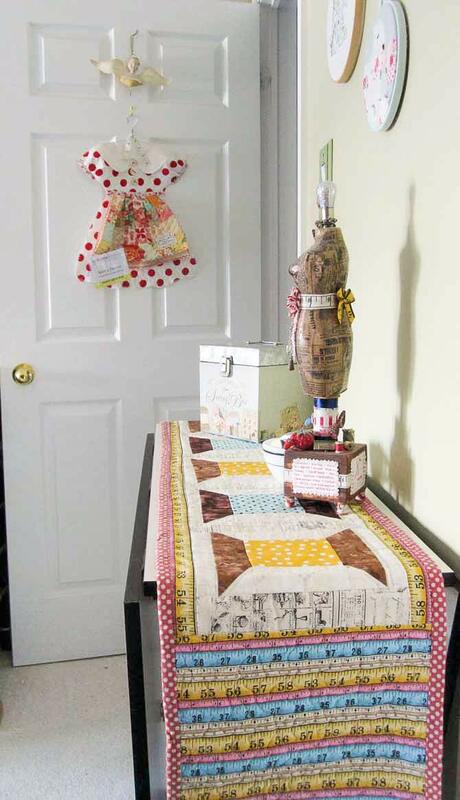 The runner looks great in your sewing space! What a pretty table runner!! Have to browse more here, I think I can get a lot of helpful hints here.